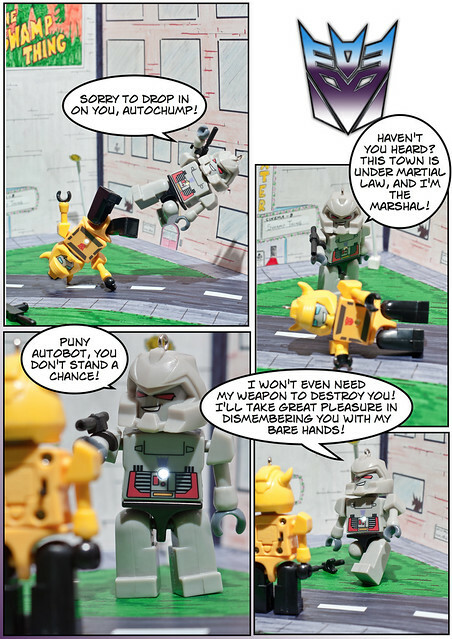 Megatron – Sorry to drop in on you, Autochump! Megatron – Puny Autobot, you don’t stand a chance! Megatron – I won’t even need my weapon to destroy you! I’ll take great pleasure in dismembering you with my bare hands! Bumblebee – Are you waiting for a formal invitation? Bring it on Megadoofus! Bumblebee – And you call yourself the leader of the Decepticons? Megatron – How dare you! Megatron – Let’s call a truce Bumblebee! How about a Hertz Donut? Bumblebee – What’s a Hertz Donut? Megatron – Hurts, don’t it? 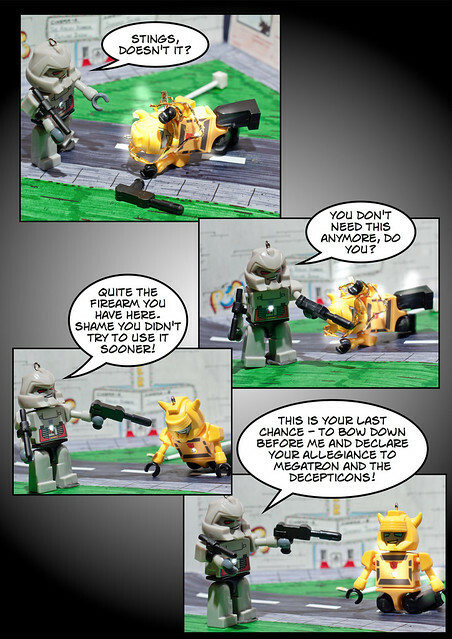 Megatron – What a dumbass! 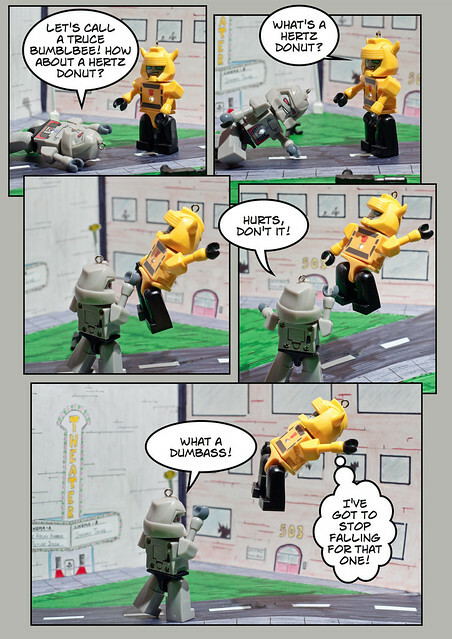 Bumblebee – I’ve got to stop falling for that one! Megatron – Your IQ is even lower than the humans you protect! Bumblebee – Keep talking! The more you lecture the more hits I land! Megatron – I underestimated you! You pack a punch after all Autobot! Megatron – I’ve gone easy on you long enough! 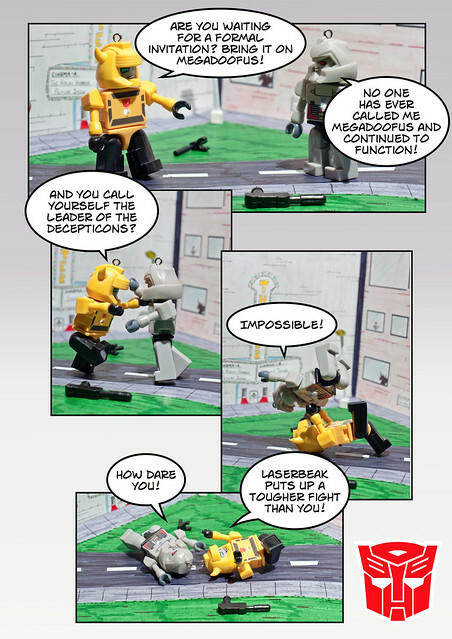 Megatron – What’s your motivation, Bumblebee? Why do you fight for Optimus and the humans? Megatron – Our race should be united! And the humans our slaves! Megatron –And why do the human scum who walk the earth deserve freedom? Bumblebee – And your head was just overshadowed by a lamppost! 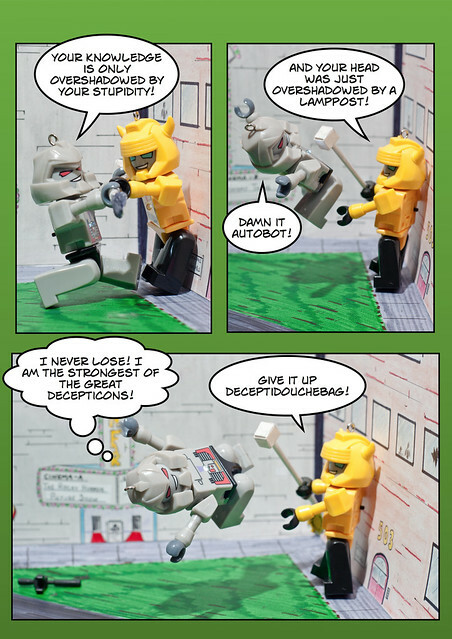 Megatron – Damn it Autobot! Megatron – I never lose! I am the strongest of the great Decepticons! 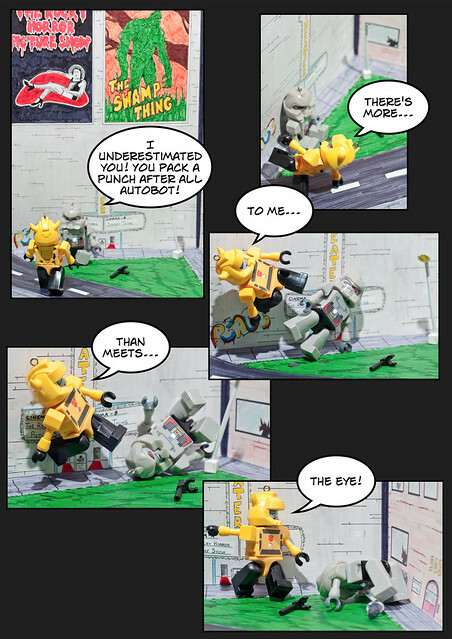 Bumblebee – Give it up Deceptidouchebag! Bumblebee –Let this be your final lesson Megatron – find another planet! Megatron – Enjoy a taste of my new weapon! 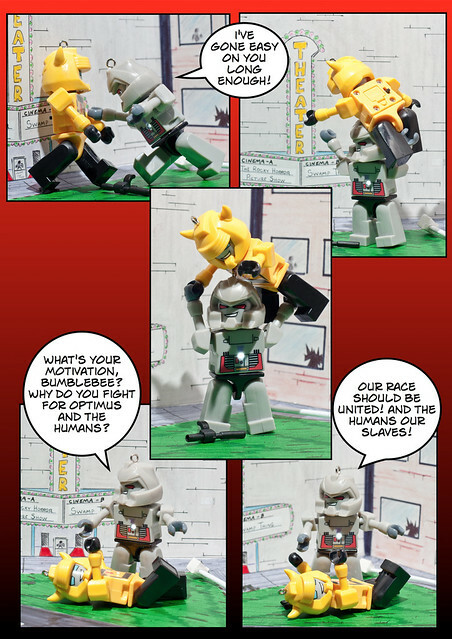 Bumblebee – I don’t like the looks of that! 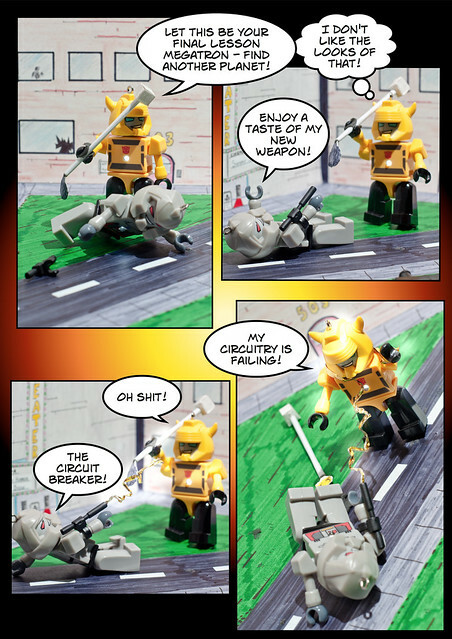 Megatron – The Circuit Breaker! 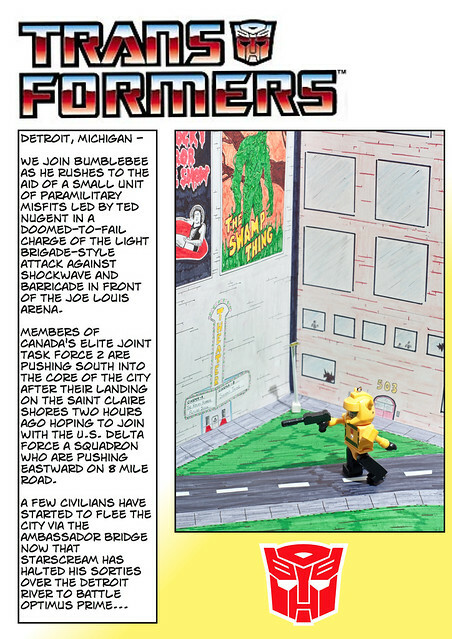 Bumblebee – My circuitry is failing! Megatron – An Autobot crying for help! Such a pitiful member of our great race! 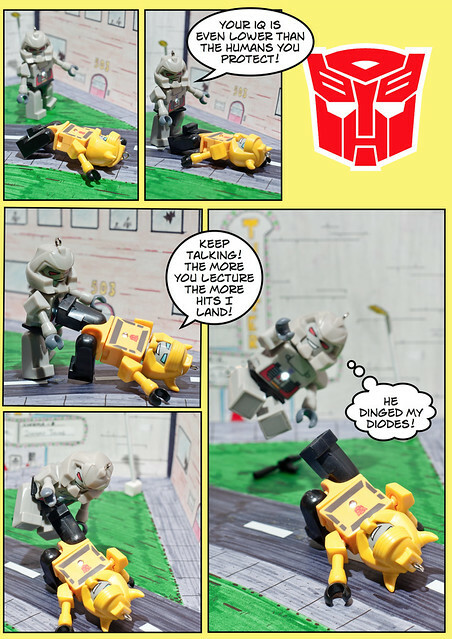 Bumblebee – I-I-I can’t move! Optimus! Hot Rod! Ironhide! Where are you? Bumblebee – Optimus! I will not fail you! 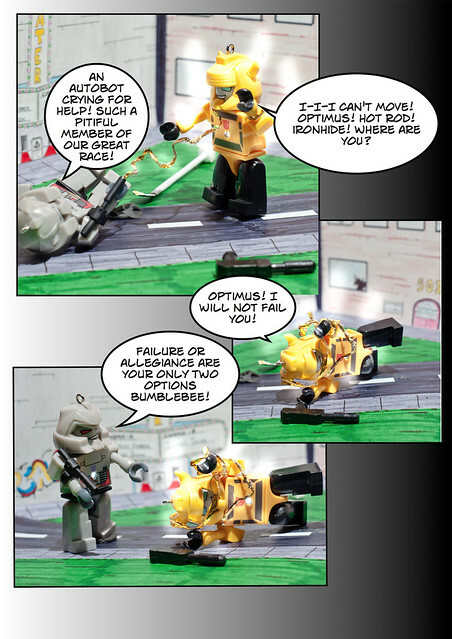 Megatron – Failure or allegiance are your only two options Bumblebee! Megatron – Stings, doesn’t it? Megatron – You don’t need this anymore, do you? Megatron – Quite the firearm you have here. Shame you didn’t try to use it sooner! Megatron – This is your last chance – to bow down before me and declare your allegiance to Megatron and the Decepticons! Megatron – How many of you Autobots must I destroy before you realize that resistance is futile? Megatron –What a waste of metal! Ted Nugent – American rock musician from Detroit, also known as The Motor City Madman, a staunch conservative and advocate of gun ownership rights [Wikipedia]. The Charge of the Light Brigade – a charge of British cavalry led by Lord Cardigan against Russian forces during the Battle of Balaclava on 25 October 1854 in the Crimean War [Wikipedia]. The Joe Louis Arena – home of the Detroit Red Wings and named after the former heavyweight champion Joe Louis [Wikipedia]. 8 Mile Road – popularized by the movie of the same name, serves as a dividing line between the wealthier, predominantly white suburbs of northern Detroit and the poorer, predominantly black city [Wikipedia]. Haven’t you heard? This town is under martial law, and I’m the marshal! – a modified quote by Megatron in Megatron’s Master Plan, Part 2 [Transformers Wiki]. No one has ever called me Megadoofus and continued to function! – from the original quote, No one does that to me and continues to function. Said by Megatron in The Transformers: Fire on the Mountain (#1.15) [IMDB]. Laserbeak is a weak mechanical bird, mini-cassette Decepticon [Transformers Wiki]. He dinged my diodes! – from the original quote by Gears – Aw, go ding your diodes and get defunct, Megatron. I’m not helping you do zilch. [Transformers Wiki]. The Autobots will never sacrifice freedom! – quote by Optimus Prime in Transformers: War for Cybertron [IMDB]. Freedom is the right of all sentient beings! – Optimus Prime’s motto. Freedom is just chaos with better lighting, imbecile! – without imbecile added, is a quote by science fiction novelist Alan Dean Foster [Wikipedia]. May the light of freedom, coming to all darkened lands, flame brightly – until at last, the darkness is no more! quote by Dwight D. Eisenhower during his Second Inaugural Address [PBS.org]. Your knowledge is only overshadowed by your stupidity! – quote by Megatron in the 1984 Transformers movie [IMDB]. 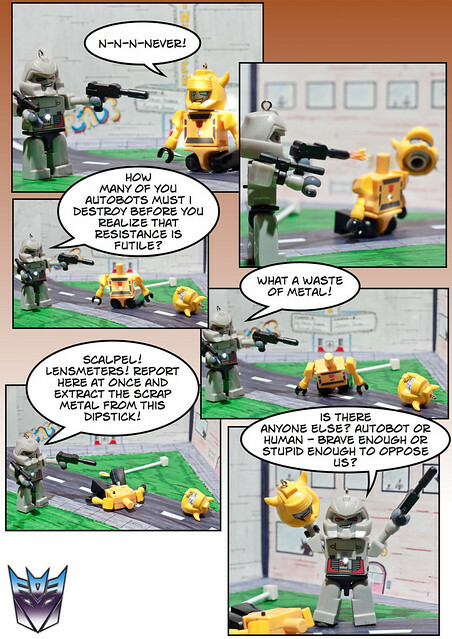 Scalpel and the Lensmeters – serve as repair medics [Transformers Wiki]. Is there anyone else? Autobot or human – brave enough or stupid enough to oppose us? – modified quote originally by Megatron in Megatron’s Master Plan: Part 2 (1985) [IMDB]. Production Notes: this is the collaborative work of two individuals – David Wood and myself. David was in charge of the set design and fight choreography while I was in charge of the story, dialogue, photography, and post production. The Megatron and Bumblebee figures were recent promotional items at Family Marts here in Taiwan. Posing them in our office at work served as the inspiration for this project. Some poses needed the aid of putty while the airborne scenes were shot using a small stick taped to the backs of the figures. Most gobs of putty and visible parts of the stick were crudely removed using the spot-removal tool in Adobe Lightroom. The comic layout was created using a very fun program called Comic Life 2.